I’ve completed this splendid 135-mile National Trail through some empty stretches of mid-Wales over two trips, one in 1992 and the other in 2016 (plus a few miles on my Cross-Wales walk in 2004). The strange thing is, I had much more trouble physically on the earlier trip (when barely 40) than on the later (when of pensionable age). I know why however, and there are two reasons. I wasn’t emotionally ‘up’ for the first trip, as my younger son had been born a few weeks before and I was guilty – quite rightly so – about leaving my wife at home alone with him and his four-year old big brother while I went off on a jolly. Plus, I was nowhere near as experienced the first time round. True, I’d completed Offa’s Dyke Path the two previous years without any problems, but that was a return to trail walking after more than a decade away, and I knew far less of what my body could accomplish than I did on the revisit. The walk runs from Knighton on the English border to Welshpool, just a few miles away from the border, by the town of Machynlleth on the Dyfi estuary to the west. The route is named for the Welsh resistance leader Owain Glyndŵr (c1359 – c1415), and links many places associated with him. 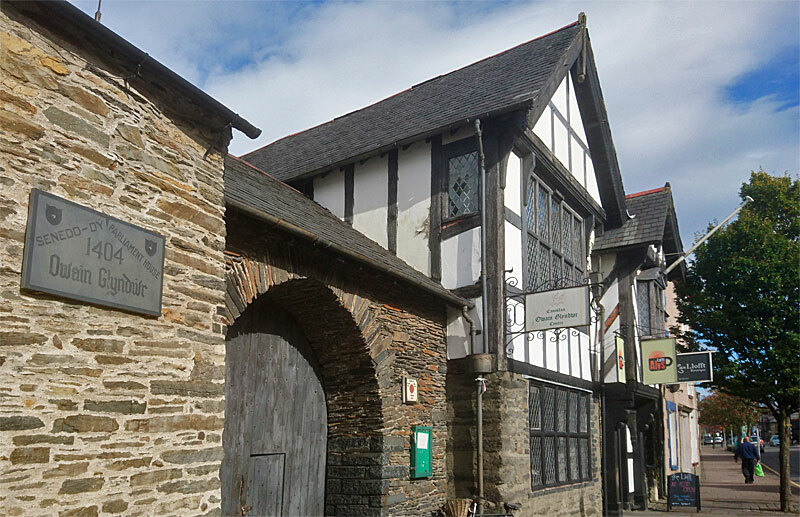 Machynlleth itself was the site of the Welsh parliament summonsed by Glyndŵr in 1404. 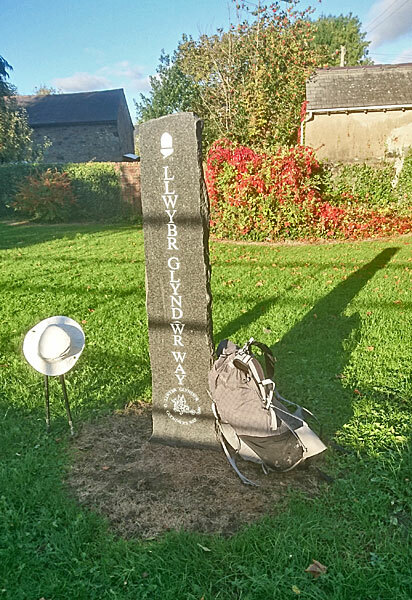 Glyndŵr’s Way was new when I first visited and indeed only became a National Trail in 2000. It is thought to be perhaps the least-walked of all the National Trails and indeed I can recall meeting few walkers at all, and none that were through-walking as was I. Perhaps this is because this is not always a walk of obvious highlights – no crashing sea coasts, no mountain heights, no string of honeyed villages, no underlying feat of ancient geology or the hand of man. Perhaps, simply, because it’s a long way from the great centres of population. But that’s all to the better for the walker with an eye for the less obvious, and (earlier travails apart) I thoroughly enjoyed my time on the Way, and its strenuous route through the working heart of rural Wales. Note also that Knighton and Welshpool are (nearly) linked by Offa’s Dyke Path, so anyone wanting a circular walk could add an extra 29 miles / two days in this way. The Cicerone guide to Glyndŵr’s Way, which I used and can recommend, includes this. The Trail makes the best of the sometimes scanty public transport network in mid-Wales, or at least its train lines. Knighton has five trains a day on the Heart of Wales line from Shrewsbury to Swansea, one of the most charming branch lines in Britain and a perfectly good reason for a visit all on its own. (The village of Llangunllo is also on the line, with one train fewer.) Even better, Machynlleth and Welshpool are both on the Cambrian line, which offers a train every hour or two from Birmingham to Aberystwyth.Each of these three towns also have reasonable bus services, some quite long-distance, as does the Way’s fourth town, Llanidloes – in its case, to Welshpool, Aberystwyth and Llandrindod Wells. However there are almost no bus services linking the villages of Glyndŵr’s Way. In the same way, there is a good range of accommodation in each of the four towns, but elsewhere provision is patchy – just the occasional inn, farmhouse or B&B. If you’re carrying a tent, which I was in 2016, you might find the occasional official camp site – I used one – but with careful thought, you might find wild camping sites where there is little or no chance of others coming across you. The law only permits wild camping with the permission of the landowner, but it’s not often easy to be sure who this is, and if you’ve got permission, it’s not really wild. So I cannot endorse my own two wild camp spots in any way (official disclaimer). Because of what happened in 1992, my stage-by-stage guide is highly unlikely to be replicated by anyone else! But the two pages that follow should give some idea of what to expect.